The commentators identify Psalm 132 as a prayer David composed upon discovering the future site of the Bet Ha'mikdash. As we read in the Book of Shemuel II (chapter 24) and the Book of Divre Hayamim I (chapter 21), God delivered a deadly plague upon the Jewish people, and the prophet instructed David that he could end the plague by offering sacrifices in the granary of a Jerusalemite named Aravna (who was also known as Arnan). David purchased the land, built an altar and offered sacrifices, and the plague immediately came to an end. Thereupon David declared, "This is the House of the Lord God, and this is <?xml:namespace prefix = st1 ns = "urn:schemas-microsoft-com:office:smarttags" />Israel's altar for burnt offerings!" (Divre Hayamim I 22:1). Indeed, that spot became the site on which the Bet Ha'mikdash was built during the time of David's son and successor, King Shelomo. According to a number of commentators, it was in response to this event, during which David learned of the future site of the Temple, that David composed chapter 132 of Tehillim. David begins by recalling the overbearing anxiety he experienced in seeking to secure a site for the Temple, to the point where he was unable to sleep (verses 3-4). David undoubtedly refers to a comment he made to the prophet Natan many years earlier: "Look, if you will – I dwell in a home of cedar wood, while the Ark of God resides behind a curtain" (Shemuel II 7:2). He felt uneasy about enjoying the comfort and security of his magnificent palace while the Ark, representing God's presence, had no permanent abode among the Jewish people. 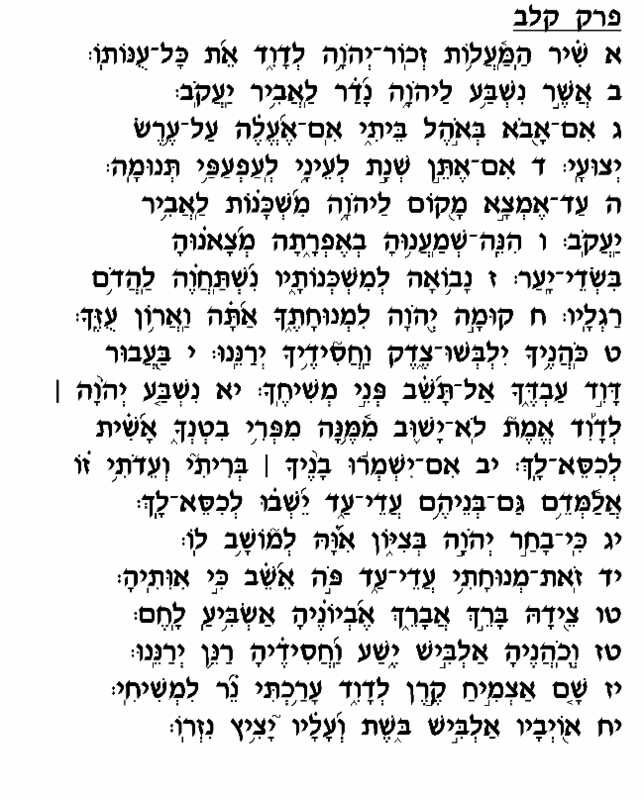 Here in Tehillim David recalls this anxiety and expresses his jubilation over finally finding the site of the Mikdash. In the latter part of this chapter (verses 11-18), David pleads to God to keep the promise He made to David through the prophet Natan (Shemuel II 7:4-16), that David's son will succeed him and build the Bet He'mikdash. God further guaranteed David that if his descendants remain loyal to Bene Yisrael's covenant with the Almighty, they will enjoy an enduring, stable kingship. Jerusalem will be blessed with wealth and prosperity, Israel's vicious enemies will collapse, and the "crown" of the Davidic dynasty will "glitter" (verse 18). Upon seeing God's promises beginning to materialize, with the discovery of the site of the Mikdash, David now pleads to the Almighty to fulfill the other promises, as well, and bless his offspring with a strong, stable and prosperous dynasty. As we know, God did not grant David permission to build the Bet Ha'mikdash, reserving this privilege instead for his son, Shelomo. In this prayer, as the Radak explains (verse 1), David asks that he should be rewarded for the efforts he expended towards the building of the Temple despite the fact that he would leave the world before the project's completion. From here we may learn the immense value of the effort and exertion invested in religious observance, regardless of the outcome. Many times, we, like David, make a sincere effort in a certain area without ever seeing the desired result. David here teaches that a person is rewarded for these efforts and hard work even if the fruits of the labor are not immediately discernible; so long as one exerts himself with sincerity and devotion, he will be credited with success even if he does not live to see the end result.